Lamar is in Prowers county. Anthem BCBS has 3 unique providers in Prowers County. Anthem BCBS has 0 unique facilities in Prowers County. Anthem BCBS has 3 total unique providers + facilities in Prowers County. Bright has 7 unique providers in Prowers County. Bright has 2 unique facilities in Prowers County. Bright has 9 total unique providers + facilities in Prowers County. Cigna has 0 unique providers in Prowers County. Cigna has 2 unique facilities in Prowers County. Cigna has 2 total unique providers + facilities in Prowers County. Colorado Choice has 34 unique providers in Prowers County. Colorado Choice has 5 unique facilities in Prowers County. Colorado Choice has 39 total unique providers + facilities in Prowers County. Denver Health has 0 unique providers in Prowers County. Denver Health has 0 unique facilities in Prowers County. 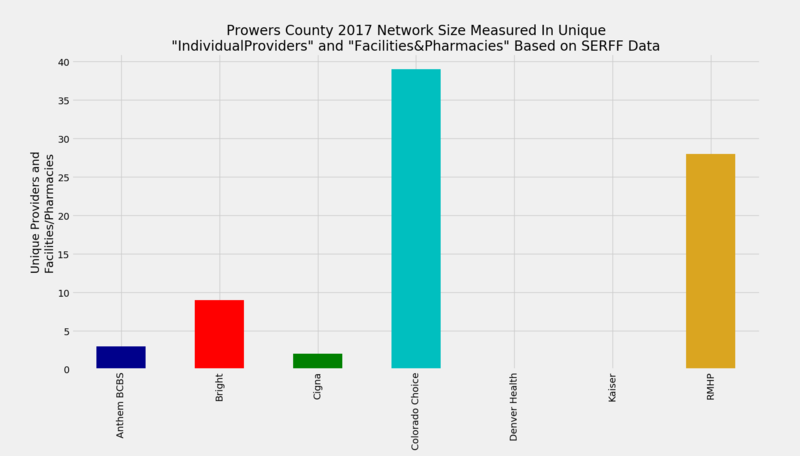 Denver Health has 0 total unique providers + facilities in Prowers County. Kaiser has 0 unique providers in Prowers County. Kaiser has 0 unique facilities in Prowers County. Kaiser has 0 total unique providers + facilities in Prowers County. RMHP has 21 unique providers in Prowers County. RMHP has 7 unique facilities in Prowers County. RMHP has 28 total unique providers + facilities in Prowers County.